Deforestation has been a huge problem which is increasing with time and creating several environmental issues. It has become a huge controversy with environmentalists. It can be defined as large scale removal of forests for the purpose of converting them to non-forest areas for agriculture, industrial activities, urbanization and other such reasons, without sufficient reforestation. 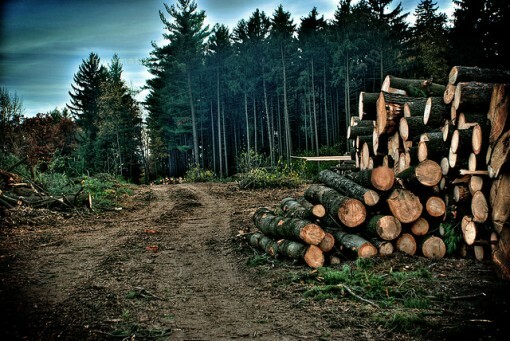 Millions of animal and plant species are in danger of being extinct as a result of deforestation. Not only this, but also it affects environment to a great extent by increasing the amount of carbon dioxide in the atmosphere. Even though, it may have economic benefits, but its negative impact has greatly outweighed the positive impact. One huge problem with deforestation is that it destroys natural habitats of animals living in forests. Due to this, a species ‘natural habitat’ is destroyed, which makes it difficult for that particular species to adapt-resulting in their extinction. Further, the result of deforestation is great decrease in biodiversity. One such species which has become extinct is Orangutans. The greatest threat to the survival of this species is rapid loss of their natural habitat in Borneo and Sumatra. Large areas of rainforest in Borneo and Sumatra have been cut down for obtaining large amount of timber and the land over there has been cleared and replanted with cash crops and palm oil plantations. Due to palm oil plantations, especially made by clearing away rainforests causes about 600 million tons of carbon leakage into the air. Besides this herbicides and pesticides are spread in the air because of this practice. Plantation owners and their co-related workers often kill Orangutans when these animals trespass into human areas in search of food, as they consider them as a threat to their valuable crop plantation. Besides this, these species has also been target of illegal hunting and baby orangutans are often hunted by hunters, who consider these animals as highly prized commodity and sell them into the illegal pet trade, after the mother Orangutan is killed. Orangutans mostly spend their time living on top of tree branches and often swing from one tree to another tree to get their food and other needs. Even though, they have strong legs, they seldom come down to ground to avoid being pray to different predators namely snakes, leopards and tigers. They have hook-shaped fingers and toes, which help them to easily, hang and swing on tree branches. The future survival of these species in the forest largely depends on human intervention, as soon these species are likely to become extinct without our help or support. In order to save these species, Rimba Raya – a biodiversity reserve has been founded to promote the conservation of endangered Orangutan species. The saddest part is that this endangered species is one among the three remaining species of apes. This reserve forms a natural barrier between palm oil’s industry constant bulldozing and Tanjung National Park, which has one of the last remaining populations of wild Orangutan species on Earth. A good thing about this reserve is that it is home to 300 species of birds, 122 species of mammals and 180 kinds of plants & trees. This biodiversity reserve takes appropriate measures to protect all these species and has taken special pledge to help protect Bornean Orangutan species. Besides this, the government of Sumatra and Borneo have taken certain steps to ensure survival of these species by declaring large areas in rainforest as a forest reserve, where land clearing and logging for palm oil or other cash crops plantation is prohibited. Further, there is some wildlife protection laws established to protect these species from being extinct. Several rehabilitation centres and sanctuaries have also been introduced to treat and care for sick, orphaned or injured orangutans. These rehabilitated species are then released back into the tropical rainforest, so as to re-populate back the forests. Thus, it can be said that deforestation should be carried out with certain limitations to ensure that it does not cause a negative impact on environment and animal species.